The weather may still be mild, but the most wonderful time of the year is upon us, and it’s time to get in the Christmas spirit! And there’s nothing better than sipping on mulled wine, stuffing our faces with mince pies, and spending quality time with family and friends. The UK is home to some of Europe’s best Christmas markets. From huge yuletide festivals to quaint little German-inspired chalets, we’ve picked out the ones on our Christmas list this year. Whether you’re looking to buy homemade artisan gifts, or simply can’t resist a bit of German Bratwurst, December is the month to do it! And it’s not all about the food and gifts, either. Many Christmas markets across the UK go all out with ice rinks in their city centres, family-friendly pantomimes, and fairground rides for a full day of festivities. Even the Scrooges and Grinches of the world can’t resist the smell of warm apple cider and freshly-baked soft pretzels. So if you’re ready to step into Christmas, then we recommend visiting some of these Christmas markets across the UK. Novikov’s Mayfair Christmas Market is back by popular demand! On Friday 30th December and Saturday 1st November, the whole of Mayfair Place will be transformed into a Winter Wonderland, complete with hand-picked stalls selling gorgeous gifts as well as mouth-watering food and drink. 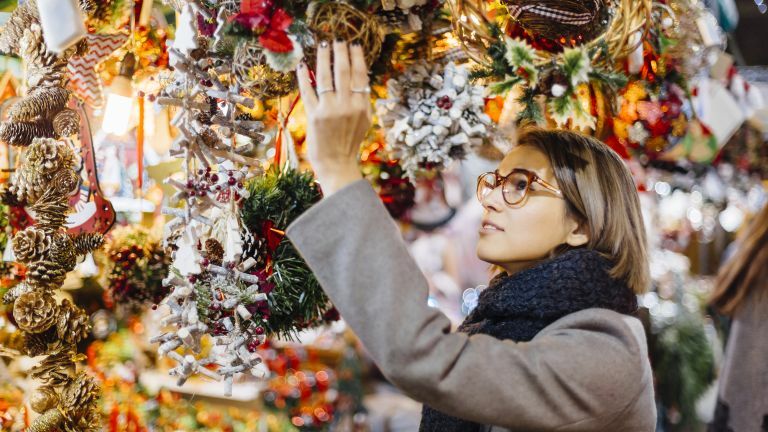 With a myriad of hand-picked stalls selling gorgeous artisan gifts, from jewellery and clothing to handmade crafts and Christmas decorations, as well as an array of mouth-watering food and drink, this really is your one-stop shop for all things yuletide. It’s a fabulous event for all the family, with Father Christmas himself entertaining on both days, and a special guest appearance by Santa’s live reindeer! Surrounding the stunning cathedral grounds is Winchester Christmas market. Starting on Saturday 17th November and running through until Thursday 20th December, Winchester’s market is inspired by traditional German markets and is the best place to buy high-quality homemade gifts for family and friends. You’ll know when you’re close because you can smell the delicious zesty scent coming from the fruit wreath stand! Winchester has over 100 chalets to explore with handcrafted items and festive foods, complete with an ice rink which makes this the perfect weekend outing in December. It’s open 10.30-6.30pm Sunday to Wednesday and 10.30-8.pm Thursday-Saturday. Bath’s Christmas Market is loved by many and provides a truly magical experience with 180 chalets that shine bright along the cobbled streets and offer a range of gifts and festive treats. This year, they’re going green, too. So you’ll see a lot of decorations made from recycled plastics and some environmentally friendly gifts on offer too. The only downside to Bath’s market is that it only runs for a short 18-day period. It opens on 22nd November and closes on 9th December, so make sure you get down early to avoid disappointment. Be warned, it gets incredibly busy, but if you want to get your hands on those beautiful artisan gifts for friends and family, Bath Christmas Market is not to be missed. Hyde Park’s Winter Wonderland is fun for all the family and is the perfect festive day out in London. From the classic German chalets to a whole Bavarian village full of festive food and drink and spectacular light displays and shows, you won’t know what to see or do first. It’s free to enter Winter Wonderland but we highly recommend booking tickets to individual attractions to avoid long queues. This year shows include Peter Pan on Ice, Teletubbies Christmas, and Zippo’s Christmas Circus, so there is something for all ages to enjoy. Winter Wonderland opens on Thursday 22nd November and runs right through into January, only closing for Christmas Day! The list of chalets and attractions is endless, so best to get planning your day of festivities now! Birmingham’s Frankfurt Christmas market is classic German market located in Victoria Square and New Street. Here you’ll find a wide offering of traditional Bratwurst, soft pretzels and schnitzel which can be washed down with a mug of warming Gluhwein. This market is open daily from 10am-9pm, with a range of chalets selling homemade gifts and a whole host of lively entertainment. It runs from 15th November through to 23rd December, giving you plenty of time to fit in your Christmas shopping and a festive tipple or two. Kicking off the festive season super early from 9th November is Manchester Christmas market, following their Christmas lights switch-on on November 3rd. It will be hosted in Albert Square as it has been for the past 4 years, but sadly this will be the final year they have it here, as they are due to start building works on the site. However, Manchester’s Christmas market is huge, spanning across nine different areas of the city with around 300 stalls selling everything from jewellery to clothes and toys. You’ll find an array of delicious world foods including Spanish Paella, German sausage and a good old Hog Roast, so you’ll be able to fully indulge yourself this Christmas. Edinburgh is going all out this Christmas, with a large festival event to rival London’s Winter Wonderland. Running for six weeks, you’ll be able to experience ice skating, theatre and pantomime shows, live music, fair ground rides and even visit Santa, so there’s plenty to keep the kids entertained. Adults will appreciate the delicious smell of mulled wine and can take refuge in the Johnny Walker Bothy Bar to warm their cockles on a cold December day with a variety of whiskey-based drinks. The Edinburgh Christmas festival runs from 16th November right through to the 5th January and festivities take place at St Andrews Square, East Princes St Gardens and George Street. The beautiful Medieval city of Salisbury is the perfect setting for a twinkling Christmas market. Located at the Guildhall, the market is made up of traditional chalets, accompanied by a jam-packed schedule of festive entertainment and activities. Be sure to check their schedule for ice rink opening times, and the Beauty and the Beast pantomime is not the be missed! Christmas in Salisbury kicks off on the 29th November, and while the market closes on the 23rd December, the ice rink staying open until 6th January. Held outside the grand City Hall, Belfast’s Christmas market is easy to get to as it’s right in the city centre. Foodies will love this market, with plenty of Belgian chocolate treats, hog roasts, cheeses and crepes to feast on. There’s a Santa’s grotto where children can pay a visit for a gift, and all donations go to Belfast’s Christmas Market’s chosen charity, Pretty ‘n’ Pink. There’s a small fair ground with traditional rides like the big wheel, where you can get a spectacular view of the city from the top. Belfast’s Christmas festivities take place between 17th November and 22nd December, with late night openings on Thursdays until 10pm!